Dubai is unquestionably one of the most glitzy and ostentatious tourism spot with multitude super luxurious shopping malls, high-rise skyscrapers, enticing bars and clubs, alluring lifestyle and tempting fun amenities around the town. And, it is obvious that the conurbation has transformed a lot since its origin, yet it never step back preserving the exquisiteness and magnificence of the nature; yet always endeavoring to blend it beautifully with modernization. Dubai is a highly sought after destination for sightseeing due to its remarkable natural and man-made sites; and if you get a chance to be in Dubai, don’t miss a chance to clasp the sunrise and sunset vistas, as this would definitely be one of your lifetime experiences and best things to do in Dubai. In Dubai, there are numerous destination to capture the mesmeric sunrise and sunset panoramas; as the city beautifully looks west over the ocean to get decent sunrises and sunsets. There are various locations in Dubai including, resorts, hotels, beaches and lounges that offer great picturesque for sunset and sunrise; though some of them are truly celestial. 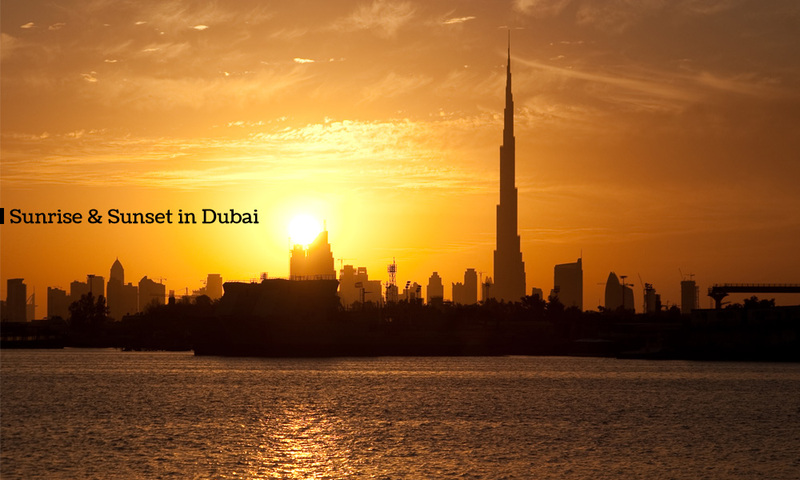 If you want to retort to sun at the dawn and the dusk, then try to reach out the below mentioned five most sought after locations that are considered ideal to enjoy the utmost natural blend of sunrise and sunset in Dubai with the Emirati landscapes. Located over the 124th of the gigantic monolith – The great Burj Khalifa; the ‘Observation Deck’ offers you the divine vista of sunrise and sunset in Dubai. If you are a shutterbug, the location is premium, as you are never going to get such extract in your life again. Watching sunset from the maximum of Burk Khalifa is like welcoming the sun in your arms by looking into its glaring eyes. This will make you feel each flicker of the sunlight passing through the thick cushions of clouds. Furthermore, the place is equally scenic for the sunset in Dubai; as watching the dusk spreading across the city while enjoying cocktails and Shisha offers you an ultimate romantic ambiance. Burj Khalifa is located on 1 Mohammed bin Rashid Blvd – Doha Street Dubai. The Madinat Jumeirah is one of the most beautiful resort complexes around the town with numerous bars, spas, restaurant and private beaches. It is one of the prime location that is considered to be quixotic by the visitors to enjoy a sunset in Dubai, while clasping the beauty of Burj Al-Arab in addition. Beautifully settled along the marine view, Madinat Jumierah is another perfect option to cheerio the sun. Madinat Jumierah is located on the Jumeirah Beach Road, next to the Wild Wadi Water Park. Although there are a lot of places, Deira Creek has got some extra factors. Situated between Bur Dubai and New Dubai, Dubai Creek is an idyllic place to romantically enjoy the sunrise and sunset in Dubai. The best way to enjoy the scenery is to get down to the Creek and hire yourself an Abra, which is a small wooden boat that charges you only 1 Dirham. A small trip through the pure emerald green water and unruffled breeze add a great essence to the entire prospect and allow you to enjoy your private space too. A boat ride on Dubai Creek with your partner is also a romantic things to do in Dubai for couples. This is one of the most beautiful spherical venues of Dubai, which offers you to get amused by the mesmerizing sunrise and sunset sights while clutching the beauty of Burj-Al-Arab and the glittering coastline. Located in the Jumeirah Beach Hotel, it is one of the finest place to enjoy enthralling sunset in Dubai, while having drinks, music and Shisha with your loved ones. Jetty Lounge is another most alluring and enticing sea facing stretch which also has a great lounge view perfect for sunsets in Dubai. This place is exquisitely attached to the beach where you may enjoy sunset over the prime balcony arrangement, which actually enhance the beauty of the entire scene by accompanying the sunset with beach and extravagant meals, drinks and lounge music. Jetty lounge has a romantic ambiance which offers you to enjoy a perfect evening out. These are some of the best places to watch sunrise and sunset in Dubai. If you want to recommend a place for a perfect view of sunrise or sunset in Dubai, please do so by adding comments below.